This will be the second instalment to my collection series with a lot more to come. For this post, I thought I switched it up a bit and go through my blushes which are probably one of my favourite makeup products. A few posts ago I wrote my Makeup Declutter so you can find out which blushers didn't make the cut and to find out which ones stayed keep reading! Near where I live there used to actually be a Kiko store which has sadly closed down now but before it did I was always in there looking through their amazing but still cost-effective makeup. The blushes I have in my collection have been discontinued because they were limited edition but I have found alternatives if you wanted to check them out. This blush has been in my everyday makeup kit for a while now, since going through all my makeup for the declutter I found this blush again that I hadn't used in ages! The shades of this blush are so beautiful and flattering and I love that you can either swirl the colour around to make a new colour or use the too pink shades separately. I find the shade all together to be very flattering on the skin and gives the skin a nice flush of pink colour. I would say that this blush is very pigmented which is a good thing but you have to apply it with a light hand as you don't want to look like you have too much blush on. The only downside about this blush is that it was a part of a limited edition collection so once I finish it I can't repurchase it but I did have a look on the Kiko website and find one that is nearly identical! These are another two blushes that I think Kiko may have discontinued or repackaged but again I have found a different blush which is near identical to these two. On a trip to the Kiko store about a year ago they were having a big sale and I managed to pick up these two blushes. They are different in shades with one being coral and the other being a much brighter pink. I actually gravitate more towards the coral shade as its more wearable for work but the pink shade is so vibrant that I wear it more for special occasions. Both of the blushes have amazing colour pay off and look really pretty on the skin. They also blend out really easily which I find can be a little harder which less expensive blushes. When swatching the colour they feel slightly chalky but you wouldn't notice it at all once it's on the skin. I haven't purchased too much makeup from The Body Shop before a bit of a whim, I did quite a big order and got a few products that I loved and some that I didn't but these blushes are definitely apart of the loved products. The Body Shop is known for its natural but still very effective products. I have had these blushes for a while and I still have been using these blushes on and off for ages and still love them. These blushes are definitely for someone who loves the more natural look because these aren't the most pigmented but in a good way. I reach for these blushes a lot when I'm getting ready for work or days when I don't want to wear a lot of makeup as it gives the skin a nice fresh pop of colour. Both of these blushes have a very slight bit of glitter to them but you can't actually tell when they are applied to the skin and this actually gives the skin a little bit of a glow. These blushers are perfect for the spring and summer and I think they would be perfect to take away on holiday! I've loved Natural Collection blushers since way before I started my collection of makeup. I used to go down to boost on the weekends when I was around 13 and 14 and always go to the natural collection stand (because it was the only brand I could afford with my pocket money) and the first thing I would gravitate to is there blushers! These blushers are probably one of the cheapest blushers in my collection but they definitely aren't the least effective. Rosey Glow which is in the newer packaging is the blush that has been in my everyday makeup bag for months now. The formula of these blushers are really nice, they not too powdery and they have a really smooth consistency which helps the blush to apply beautifully to the skin. Since the packaging has been updated all of the products from the band look a lot more expensive than it really is which is amazing. As you can tell from the name that the blushers from this brand are very natural but they are also buildable, you can keep adding the blush if you're wanting more pigmentation without it looking like its too much colour. These blushes are the most expensive ones in my collection even though they are actually samples that I've got from different Christmas collections. I have been using these blushers for years and I still have loads of product left! For blushers I do think that these are slightly more on the pricey side, If I was to repurchase mine I would get the mini travel size version as they are a lot more cost effective. Galifornia is a really pretty coral colour with a very slight shimmer to it which gives the look that you have a bit of highlighter on as well which I really like, this shade is going to be one of the products that I'll be taking on holiday with me as I think it would be a great shade for when I get a bit of a tan. Rockateur is also a really pretty colour, I wear this one a lot more as its more of a natural and more wearable colour for every day and to wear to work. Both of the blushes have a really lovely consistency and pigmentation, they apply to the cheeks beautiful with very little effort and they also don't need too much blending to get a seamless colour to the cheeks. All of these blushers in the others category are all form separate brands that I don't have 2 or more of. I have mentioned this blush numerous amount of times on my blog because of how much I love it for example in my January Favourites. This blush has been a favourite of mine since I first tried it out. The colour is so vibrant and bright and it might look a little scary before you apply it but once it's on the skin it gives the skin a lovely pop of colour. This blush does apply a lot of colour so when applying it I do have to use a light hand as I don't want it to look like I've applied way too much. This is a blush that I would wear mainly in the evening or for a special occasion because of the pop of colour that it gives. This blush is also an amazing price so I'm definitely going to be trying out more of the shades. When I was a young teenager I always felt more grown up if I was using a Bourjois product especially this blush. The Little Round Pot blushers are so nostalgic to me because I remember taking my mums to use on myself. I got this one a while ago and thought I would try them out again. This blush is a baked blush which I haven't got another one of in my collection. This blush is a really pretty shade with a mix of pink and a rose gold shade and also has a slight shimmer to it. To get the best colour pay off from this blush the best way to use it is to apply a few layers of it because it is a nice buildable colour. I've actually also used this blush as an eyeshadow shade and it gives off a gorgeous golden pink sheen of colour. This blush is probably my least used of all of the blushers in my collection. The colour of this blush is a really pretty mix between a coral and a pink but it does have glitter in which I used to like in blushers but not so much anymore. I didn't get rid of this blush in my declutter because I do still use it but it has to be a specific occasion. If this blush had a lot less glitter I would definitely wear it more often because of how much I like the shade. The formula of this blush is slightly on the powdery side but that may also be because of the added glitter. This blush also comes with an added brush that I may have used when I was a teen but definitely not now. Going through all of my blushes for this post has helped me rediscover some that I haven't used in a while! Have you tried any of these blushers before? To view, all of my other Makeup Collection click here! I love blushes! Not many people rave about them but I love applying blush. I love the look of all of the blushes you have mentioned, especially the kiko blushes. Kiko is probably one of my favourite makeup brands! Can't wait to see your other collection posts! I love using blusher but I am so bad for not wanting to spend money on new products in case I end up not liking them. I end up stuck with the same product, I use a NYX one at the moment. I'm quite a fan on The Body Shop so maybe I will try them out next, or the Natural Collection isn't going to set me back much. These are all so beautiful and you've got some that are real bargains in here too! 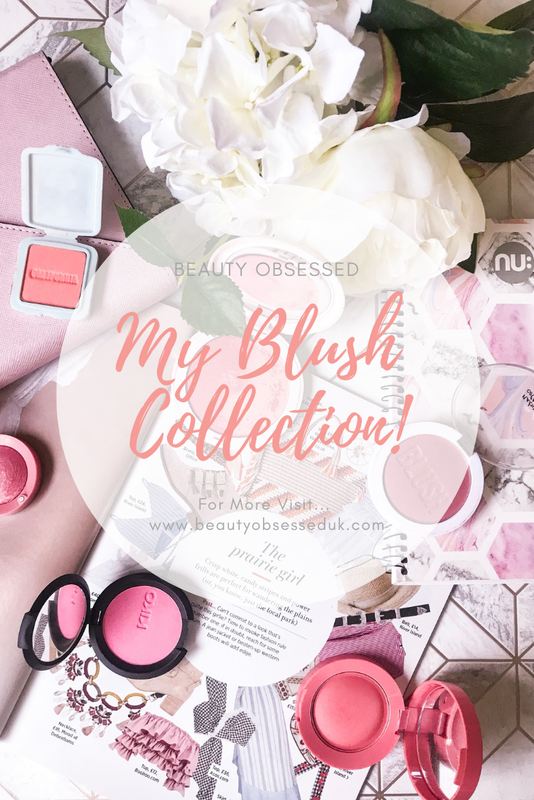 I actually don't own any of these ones but I have to say my blush collection is probably the smallest collection of all my makeup items because I find they last for absolutely ages- it probably doesn't help that I often to forget to wear it haha! I've never been that in to blush but I've previously owned the natural collection ones and I think they're perfect for the price! I always love blushes from Bourgeois! So gorgeous! Although Kiko are very good too! This is quite a collection! I love your collection posts <3 I personally prefer a more peachy shade of blusher on myself - sometimes pinky blushers just make me look like I've been for a run haha! I love The Body Shop for make up! They're amazing! Oh you have quite the collection, I only own 2 blushers �� One is the Bourjois one that you've posted. I always have to wear a bit of blusher as people ask me if I'm not feeling well when I don't as I'm so pale! I've used eyeshadows from the Body Shop before but not their blushers, I'll have to check them out. So annoying when they discontinue something you enjoy! 😭 But I like the look of The Body Shop ones, and I forgot about the Natural Collection! I used to love their eyeliner but I haven't been to Boots in ages! I never wear blush because they always break me out. I have super sensitive skin but this collection has me excited to trying it out again. Which would you recommend for a caramel skin tone? Love the Kiko Coral blush!